A few more shots from my series of getting out and about in Liverpool, my current hometown. Not my usual stuff but I haven't much time to get out and shoot landscapes and I am enjoying finding interesting / beautiful things in my local area. 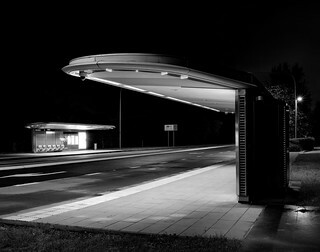 I wanted to get back and shoot the bus stop from last week in a better fashion. Was quite busy at this time and was getting hassled by too many locals so I moved on before getting the re-do of last weeks shot. Still happy with this though. Fuji X-Pro1, bracketed and stitched.